Explanation: What can you see in the night sky this summer? The featured graphic gives a few highlights for Earth's northern hemisphere. Viewed as a clock face centered at the bottom, early (northern) summer sky events fan out toward the left, while late summer events are projected toward the right. Objects relatively close to Earth are illustrated, in general, as nearer to the cartoon figure with the telescope at the bottom center -- although almost everything pictured can be seen without a telescope. As happens during any season, constellations appear the same year to year, and meteor showers occur on or near the same dates. 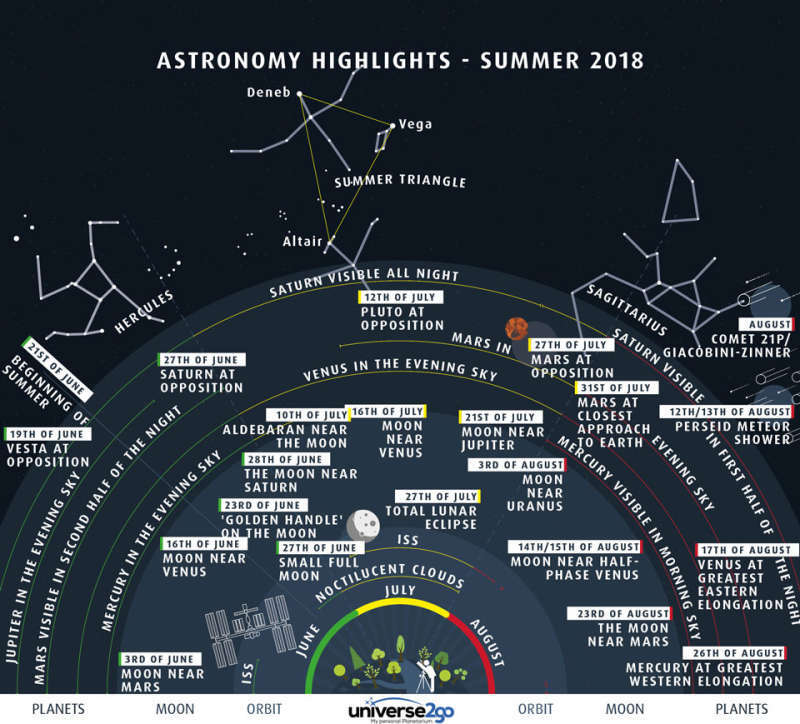 For example, like last year, the stars of the Summer Triangle will be nighttime icons for most the season, while the Perseids meteor shower will peak in mid-August, as usual. Highlights specific to this summer's sky include that Jupiter will be visible after sunset during June, and Venus will shine brightly in the evening sky during July and August. Saturn and Mars should be visible during much of this season's night, with Saturn appearing in the direction opposite the Sun in late June, and Mars at opposition in late July. Finally, a total lunar eclipse should be visible to anyone who can see the Moon in late July.